2012 Olga Raffault, Chinon Rouge, Les Picasses, Loire Valley, France. 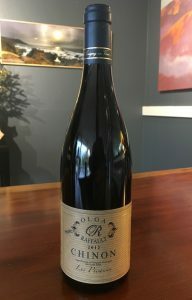 Wonderfully old school and elegant, the Olga Raffault Chinon Les Picasses is a pure and age worthy Cabernet Franc that pays tribute to the late Olga Raffault, who past a few years back, and who’s Domaine Olga Raffault is now and currently run by her granddaughter Sylvie and her husband Eric de la Vigerie who have faithfully carried on her tradition and style. These wines seem to last forever, I’ve been luck to try wines from Raffault dating back into the 70’s and 80’s and they remain vibrant and fresh with incredible structure and show lovely dimension and detail with classic red fruits, light bell pepper and mineral. The Les Picasses, from 50 old vines grown on limestone and alluvial clay soils from a single ancient riverbank plot is fermented and aged in large 30HL wood vats, about 800 gallon oak casks, where the Cabernet Franc is usually raised for between 12 and 18 months, though in some vintage the elevage can last 2 to 3 years, after being moved to chestnut casks and in more recent years they have experimented with more stainless in the wines, though this cuvee is all in the wood. The Les Picasses gets a bit of bottling aging before release, at least a year, and sometimes more, it averages about 48 months after harvest to allow things to be more softened when sold.Their importer, Louis/Dressner adds, Raffault’s Les Picasses’ often has a light garnet color belying the depth of fruit flavor and complexity. Its style is rustic, quite earthy, with hints of orange zest and deep, dark cherry flavor. The tannins are soft, but present, and the mineral complexity in the finish is superb, to which I certainly agree, I adored the 2007, 2008 and 2010 vintages, so I was excited to get my hands on this 2012, and it does not disappoint with a surprising and welcome fresh array of flavors with a sweet violet and saddle leather earthy nose leading to a fine palate of blackberry, currant, black cherry and plum fruits along with a hint of bell pepper, wild ceps, minty anise, stony elements and light cedar. This is so easy to love and a classic Loire Cabernet Franc, but with a bright intensity and freshness that makes it seem lighter than it is, especially with food where it deepens and adds even more complex detail, drink with robust cuisine over the next decade.